Pre-season testing has shown the teams to be closer matched than ever before so as the teams prepare to head to Australia for the first Grand Prix of the 2013 season I take a look at where each team stands following the final pre-season test in Barcelona. The Milton Keynes based team finished the four days with the 12th and 14th fastest times but it is unlikely that they will be that far back when racing begins in two weeks in Australia. The team are known to hide their real pace during testing and this year appears no different. The car looked good when completing long runs and race simulations. Mark Webber’s race simulation on Thursday as the track had started to dry out showed the Red Bull to be able to achieve laps way out of the reach of other teams suggesting that the RB8 could have an advantage over other teams in Melbourne. The team completed 314 laps over the four days and look to be in a strong position heading to the first race. McLaren ended the four days testing having completed 395 laps and with the fifth and 15th fastest times. Jenson Button’s time was set on the final day of testing and showed that the car has the potential to be amongst the front runners over one lap, however the time was still over one second slower than the Mercedes. Whilst some of McLaren’s longer runs have been slower than the other top teams they should still be competing for the podium in Australia but this may not quite stretch to a win. The car should ultimately still have the pace to challenge for the championships. The Ferrari performed well at the final pre-season test setting competitive times on single lap runs. Fernando Alonso ended the week with the second fastest time whilst Felipe Massa set the fourth fastest time, even more impressive was that Alonso’s time was within four tenths of the Mercedes leading time. Together the two drivers managed 428 laps showing the reliability of the F138 and its strength against the other front runners. The team should be in contention for the race win in Melbourne and could even have both drivers on the podium however Alonso has suggested Ferrari is still behind McLaren and Red Bull. Mercedes topped the timesheets on two days of the test and ended the four days with the first and third fastest times. Whilst the Mercedes had previously topped the timesheets in the other two tests it never ended the week with the fastest time. The performance of the car has led some to question what we can really read into the times, however the Mercedes certainly looks quick over one lap and should feature at the front during the first race. The team continues to downplay its chances of winning races and contesting the championship but the car looks to have the ability to win at least one race in the season and should be in contention in Melbourne. Lotus set fairly conservative lap times during the final test ending the four days with the eighth and 11th fastest times. Kimi Raikkonen suffered limited running after illness and a gearbox change on his only day of running. The Lotus will be a top-ten contender and should be able to challenge for some podiums early in the season. Winning a race is not out of the question but the cars at the front all appear to be close. The team managed 262 laps, a relatively low figure compared with the other teams. The Sauber managed 388 laps in Barcelona and set the sixth and 13th fastest times. Although the time set by Nico Hulkenberg was impressive and the Sauber should be a contender in the top ten it is fair to say it is unlikely that the C32 will qualify in sixth in Melbourne. The consistent running from the team suggests they should be regular point scorers during the season however both drivers said that tyre degradation was high during race simulations. Force India ended the test session with the seventh and ninth fastest times but with the midfield and front of the field so tight this may not be where the cars end up in Melbourne. Paul di Resta and newly confirmed driver Adrian Sutil completed 340 laps between them and both completed race simulations. The team appear to be in a stronger position heading to Australia than they were last year and should be capable of scoring points, however Sutil’s lack of time in the car and year out may hinder the team for the first few races. Williams finished the final test with the 10th and 11th fastest time which appears to be a fair reflection of their pace heading to Barcelona. Together they managed 298 laps as they assessed aero revisions on their FW35. The times were roughly two seconds off the pace of the Mercedes but as with all the times it is unknown what the fuel loads were and the tyre compounds were different. Toro Rosso completed 325 laps and managed to set the 19th and 21st fastest times at the last test. The situation was similar to the previous tests were the STR8 has looked good on some days and disappointing on others. The team used the dry running on the afternoons of Saturday and Sunday to complete long runs. Although the car has the potential to score points this season the midfield is incredibly tight and the team face the likelihood of leaving Melbourne without a top ten finish. Caterham completed 363 laps and set the 17th and 23rd fastest times on Barcelona. Despite setting a faster time than either Marussia driver they still look to be behind their rivals and seem to have taken a step back from point scoring. They will want to bring some upgrades and updates for their car throughout the season to stand a chance of maintaining 10th in the constructors and beating Marussia. Marussia set the 18th and 22nd fastest times of testing with Max Chilton and new recruit Jules Bianchi. Luiz Razia found his contract had been terminated on Friday and Bianchi replaced him after losing out on the second seat at Force India. Bianchi’s time was nearly one second faster than teammate Chilton. The team completed 338 laps and still look to be ahead of their backmarker rivals Caterham. They have their best chance of claiming 10th in the constructors championship since entering F1 in 2010 but point scoring still seems a long way off unless there is another race like Brazil 2012. Nico Rosberg set the fastest time on the fourth and final day of the last pre-season test in Barcelona. The Mercedes driver set a faster time that teammate Lewis Hamilton had on day three and managed to complete 131 laps. Fernando Alonso was second fastest for Ferrari after setting a time on a soft set of tyres and was another driver to break into triple figures for laps completed after managing 120. The team had been running a new exhaust for the first time today after bringing updates prior to Melbourne. The McLaren of Jenson Button was third fastest on the last day after completing 122 laps. The car looks much more competitive than it did at the last pre-season test last week. Nico Hulkenberg set the fourth fastest time for Sauber in the morning session and focused on a race simulation in the afternoon. He managed 118 laps for the team and showed reasonable pace. Kimi Raikkonen was back in the car today after illness yesterday but his morning running was limited after a gearbox problem meant the unit having to be replaced. His fastest time was still enough for fifth on the timesheets but he only completed 50 laps. Paul di Resta set the sixth fastest time for Force India, only marginally slower than Raikkonen’s time. He like many others focused on long runs in the afternoon amassing 112 laps. Williams once again split their running between both Pastor Maldonado and Valtteri Bottas with Maldonado setting the seventh fastest time and Bottas the ninth fastest time. Together they completed 73 laps. Sebastian Vettel set the eighth fastest time for Red Bull and also broke into triple figures with 100 laps completed. Behind him Charles Pic was 10th in the Caterham on a more positive day of running for them. Marussia split their running between both drivers with Jules Bianchi setting the 11th fastest time and 62 laps whilst Max Chilton set the 13th fastest time and managed 49 laps but was almost a second slower than his new teammate. Daniel Ricciardo set the 12th fastest time for Toro Rosso and completed 91 laps after focusing on longer runs in the afternoon session. The final day of testing marks two weeks until the first race of the season in Melbourne. The final test has seen a pecking order begin to emerge and I will be taking a further look at where each of the teams are in my team-by-team analysis next week. Starting from next week I will also be providing 2013 previews for each team looking back at 2012, their driver line-ups for 2013 and what pre-season testing has suggested. Lewis Hamilton set the fastest time on the third day of the final pre-season test in Barcelona. Hamilton set the time in the 1m20s on a soft set of tyres during the morning session and went on to complete 117 laps in the Mercedes. Behind him Massa set the second fastest time in the Ferrari, but he nearly a second slower than the Mercedes. His best time was set on a pair of super-soft tyres in the afternoon session before his day came to a premature end when the wheel came off the F138 bringing out the red flags. Adrian Sutil set the third fastest time on a set of soft tyres in the morning session before completing a race simulation in the afternoon and racking up 109 laps for Force India. The Williams’ of Pastor Maldonado and Valtteri Bottas set the fourth and fifth fastest times as they shared the day completing 65 laps between them. Esteban Gutierrez set the sixth fastest time for Sauber in the morning session and focused on long runs in the afternoon completing 99 laps. Mark Webber was seventh for Red Bull after spending the day completing aero work and testing the harder tyres. Behind him Sergio Perez was eighth for McLaren and Jean-Eric Vergne ninth for Toro Rosso after completing longer runs. Romain Grosjean set the 10th fastest time after returning for Lotus in the afternoon following Kimi Raikkonen’s illness. Davide Valsecchi had run in the morning setting the 11th fastest time. Jules Bianchi’s first run in the Marussia saw him set the 12th fastest time ahead of Giedo van der Garde in the Caterham. Pre-season testing finishes tomorrow in Barcelona. Red Bull finished the four days of testing with the fifth fastest time set on the soft tyre and the 13th fastest time. Sebastian Vettel has said that he expects Red Bull to start the season better than it did last year but still expects this season to be very close. The team completed a race simulation, at the same time as Lotus, on Thursday with Mark Webber and the two teams appeared evenly matched. Overall the team managed 322 laps and their testing program in the lead up to Australia has gone well. At the final pre-season test we may be able to see how Red Bull is fairing against the other teams. Despite the team having the fastest time of the four days with Sergio Perez they appeared to still be struggling to understand their car. Perez’s time was set on the softer compound tyre on the second day. The team amassed 315 laps over the four days and ended up with the first and 11th best times of the week. But Button’s long runs on Thursday afternoon suggest that the team is not quite where it wants to be and could struggle to challenge the Red Bull and Ferrari. The team will want to work harder to understand their car and give themselves the best chance in Melbourne. Fernando Alonso got his first taste of the 2013 car on Tuesday after deciding to sit out of the first test in Jerez. His time on Thursday left him with the second fastest time overall of the week with Felipe Massa setting 22nd fastest time after only running on the rainy final day. Together the two drivers managed a total of 363 laps however the team did not complete a full race simulation as other teams did and this makes it difficult to compare the car and its pace to the other teams. Lotus managed the fourth and eighth fastest times over the four days after completing 274 laps and a full race simulation from Romain Grosjean. Despite some issues with Kimi Raikkonen’s gearbox on the Wednesday of the test which left him in the pits for much of the morning session the E21 appears consistent. Grosjean’s times in his full race distance run were comparable to Red Bull’s and showed that would not have been separated by much during a race. Lotus team principal Eric Boullier has downplayed the performance of the car until the final pre-season test, saying the final updates in preparation for Australia are all that matter. Mercedes topped both Tuesday’s and Friday’s sessions with Nico Rosberg and Lewis Hamilton respectively. However they only ended the week with the sixth and ninth fastest times after completing 335 laps. The team looks as if it is going to be more competitive than last year, however Hamilton has said that he does not expect the team to be challenging for wins. The car certainly looks as it has the potential to be quick and could spring a surprise come the first race in Australia. Sauber completed 308 laps during the four day test with Nico Hulkenberg setting the third fastest time of the test on the Thursday. Prior to the impressive time from Hulkenberg the C32 had looked disappointing over testing, consistently being slower than its midfield rivals. Esteban Guiterrez set the 18th fastest time however he was running on Tuesday’s relatively green track and during Friday’s damp session. The form of the car over the past few days suggests it could be in a similar position to last year and capable of challenging for podiums. Force India chose to run three different drivers for the four day test. Paul di Resta tested for the first two days setting the 16th fastest time of the test. Adrian Sutil got his first taste of an F1 car in over a year on Thursday setting the 12th fastest time of the week over a second faster than Di Resta’s time. Jules Bianchi drove on the Friday during the wet session setting the 19th fastest time of the test. Between them they completed 318 laps and look as if they can challenge what appears to be a tight midfield. The team’s second driver should hopefully be announced before next week’s Barcelona test. Barcelona is the first outing for the FW35 and the car looks as if it could be a contender for the top of the midfield. Pastor Maldonado set the eighth fastest time of the test whilst Valtteri Bottas set the 10th fastest time of the test. Both times were roughly one second slower than the time set by Sergio Perez in the McLaren. Maldonado said he was positive about the new car as it had completed lots of miles without problems. The Toro Rosso STR8 looked good on certain days of the test with Jean Eric Vergne setting the third fastest time on Firday however this was over a second slower than his best time in the 1m23s. 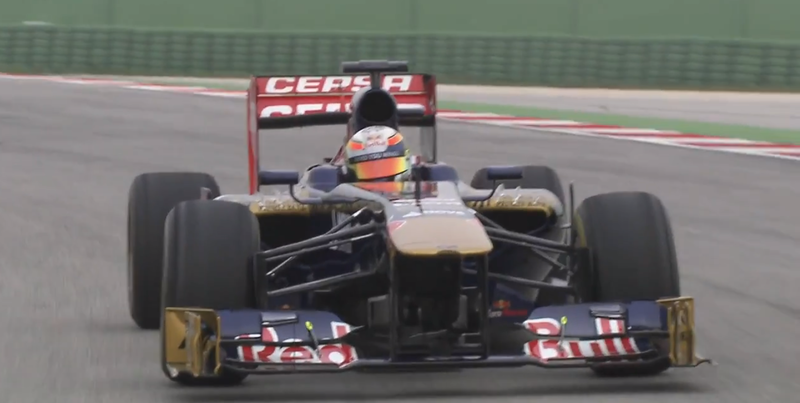 Toro Rosso ended the test with the 14th and 15th fastest times and completed 329 laps. The team look to be in a similar position to where they were last year and in Australia should be in tight competition with the other midfield teams. The team set the 20th and 21st times in Barcelona with Giedo van der Garde and Charles Pic testing for the team. Between them they completed 284 laps with their best lap times in the 1m26s around five seconds behind the time set by McLaren. The team currently look to be behind their backmaker rivals Marussia and will want to bring some updates in order to keep them in contention for 10th in the constructors championship. Marussia Marussia decided to run Max Chilton for all four days of the pre-season test in Barcelona, leaving new recruit Luiz Razia without the chance to test the car. Razia was scheduled to run for two days of the test but Marussia said it made sense to keep Chilton in the car for the sake of consistency. Chilton set the 17th fastest time of the test with a time in the 1m25s, around four seconds off the pace of the McLaren. Chilton completed a total of 241 laps. The Marussia currently looks faster than their backmaker rivals Caterham. It should be remembered that the times set in testing are unlikely to be a true gauge of each cars performance. Lewis Hamilton set the fastest time for Mercedes on the final day of the second pre-season test in Barcelona. Hamilton set the time on medium tyres in between the rainy conditions of the morning session. The Briton completed 52 laps on a day that saw eight red flags, with one of the final caused by Hamilton himself. The final red flag of the day was caused by Jules Bianchi and the session was cut short following this. Bianchi had taken over the Force India from Adrian Sutil and he set the fourth fastest time although this was over two seconds slower than the time Sutil had set on Thursday. Jenson Button recovered from a disappointing day on Thursday to set the second fastest time and completed 70 laps for McLaren. Jean-Eric Vergne was the only driver to use the softer compound tyre and he set the third fastest time of the day. Sauber’s Esteban Gutierrez set the fifth fastest time of the day despite causing one of the first red flags of the day after ending up in the gravel trap. Giedo van der Garde was sixth ahead of Felipe Massa in the Ferrari and Mark Webber in the Red Bull. Max Chilton was ninth for Marussia and Romain Grosjean set the 10th fastest time for Lotus. At Williams Valtteri Bottas and Pastor Maldonado shared duties, completing 36 laps between them but not setting a time. The final pre-season test will take place in Barcelona next week. Fernando Alonso set the fastest time on the third day of second pre-season test in Barcelona. The Spaniard set his time on the soft tyre and completed 97 laps. His time was set in the morning session and remained unchallenged as many teams decided to complete race simulations in the afternoon. Nico Hulkenberg set the second fastest time for Sauber, with his best effort coming on the soft tyre in the morning session. Romain Grosjean set the third fastest time in the Lotus after completing 119 laps and a race simulation. Nico Rosberg set the fourth fastest time ahead of Pastor Maldonado in the Williams who set the fifth fastest time. Valtteri Bottas took over from Maldonado to set the sixth fastest time of the day after 68 laps. Jenson Button struggled in the McLaren only setting the seventh fastest time after 71 laps. Adrian Sutil returned to F1 for Force India completing 78 laps and setting the eighth fastest time on the soft tyre. His Thursday time was almost one second faster than the time set by Paul di Resta on Wednesday. Behind him Mark Webber completed 108 laps and set the ninth fastest time ahead of Jean-Eric Vergne who managed 106 laps and 10th place. Max Chilton set the 11th fastest time in the Marussia whilst Giedo van der Garde set the 12th fastest time after completing 93 laps for Caterham. Tomorrow Jules Bianchi will take over from Sutil and drive the Force India as the pair compete for the second seat at the team. The weather forecast for tomorrows session is rain. McLaren’s Sergio Perez set the fastest time on day two of the second pre-season test in Barcelona. The Mexican driver completed 97 laps and set his fastest time on the soft compound tyre. Sebastian Vettel set the second fastest time after 84 laps, his fastest time in the Red Bull also coming on the soft tyre. Red Bull attempted to complete a race simulation in the afternoon but this was disrupted after the car stopped out on track causing a red flag. Kimi Raikkonen spent much of the morning in the pits after his E21 needed a gearbox change. He eventually managed 43 laps and the third fastest time on the medium tyre. Behind him Lewis Hamilton set the fourth fastest time on the hard compound tyre ahead of Fernando Alonso who set the fifth fastest time. Valtteri Bottas set the sixth fastest time on his first outing in the FW35 ahead of Daniel Ricciardo, Paul di Resta and Nico Hulkenberg. Max Chilton set the 10th fastest time ahead of Charles Pic in the Marussia, who managed 102 laps. Testing continues in Barcelona tomorrow where Mark Webber, Romain Grosjean, Jenson Button, Jean-Eric Vergne, Giedo van der Garde and Luiz Razia will all test in place of their teammates. At Force India Adrian Sutil will test for the team, his first time driving a F1 car for over a year. For full times, laps completed and tyre compounds see http://www.autosport.com/news/report.php/id/105640. Nico Rosberg set the fastest time on the first day of the second pre-season test in Barcelona. Rosberg set his fastest time in the Mercedes on the medium tyre during the final part of the day after spending much of the morning dealing with gearbox issues. Closely behind Rosberg was Kimi Raikkonen in the Lotus setting the second fastest time after 44 laps of running. Fernando Alonso’s first taste of the F138 saw him set the third fastest time on the medium tyre. He managed 110 laps on Tuesday, the most of any driver. Red Bull’s Sebastian Vettel set the fourth fastest time after having been the first driver to break into the 1m22s. The first outing of the new Williams FW35 saw Pastor Maldonado set the fifth fastest time, completing 86 laps. His fastest time came on a soft set of tyres. Behind hime Daniel Ricciardo set the sixth fastest time in the Toro Rosso, showing that the STR8 could be one of the strong challengers in the midfield. McLaren’s Sergio Perez could only manage to set the seventh fastest time ahead of Force India’s Paul di Resta in eighth. Esteban Gutierrez set the ninth fastest time in the Sauber after causing the first red flag of the day after running low on fuel. Max Chilton set the 10th fastest time for Marussia whilst Charles Pic set the 11th fastest time for Caterham. Whilst testing times should not be taken as a true gauge of the cars relative performance, the start of the second pre-season test should help to establish a potential running order for Australia. Pre-season testing continues in Barcelona tomorrow where Lewis Hamilton, Nico Hulkenberg and Valtteri Bottas will take over the driving from their respective teammates.